Many find highsec to be a place of chaos and confusion. That's certainly true for newbies ascending the learning cliff of EVE, but even veterans of the game can be baffled by highsec life. In such a situation, how does one find one's way? The answer: Follow the Code. It always points the way. Always. "You monsters!" the rebel shouts. "You gank Ventures!" Ah, but if Ventures weren't meant to be ganked, why do they carry such cargo? And why do the cheap Ventures allow their expensive brothers to hide among them? 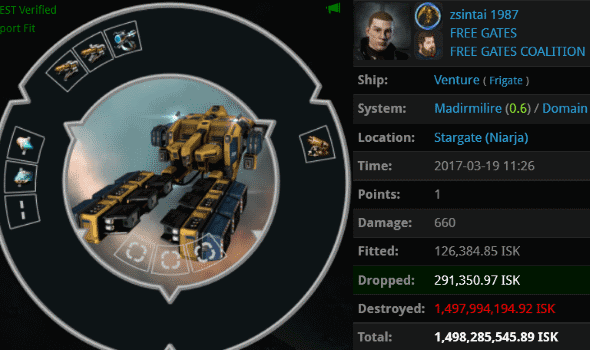 zsintai 1987 pretended to be a helpless newbie, but his ship was worth 1.5 billion isk. Agent Aaaarrgg tuned out the noise and simply obeyed the Code. In zsintai's case, the skill extraction may have been a bit too successful. Everyone knows that ORE mining lasers are illegal in highsec, but Alestasia MarcEdwards didn't think the rules applied to her. Oh, how wrong she was--and Agents Fiddly Pop, Jana Grebb, and Zane Arnolles were eager to show her. Scratch two more ORE Ice Harvesters. ...Ah, the complete set. Alestasia was also carrying a pair of ORE Strip Miners in her cargo. Not anymore, though. Machines aren't known for their laziness, so why are all the bot-aspirants so lazy? Lexa E needed to haul some expensive cargo, so he assembled a completely unfit Marauder and went on autopilot. Nice try. Agents Tax Collector Richard, Pod Destroyer Molly, Taxman Daniel, and Tax Collector HongMei saw through his disguise right away. 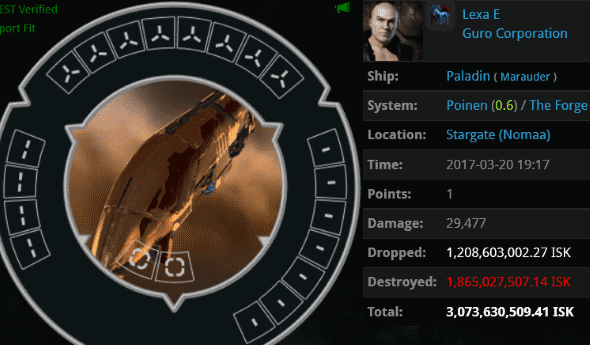 The Paladin was hauling hundreds of tags worth nearly two billion isk. Lexa's ship will be abused in this way no more. 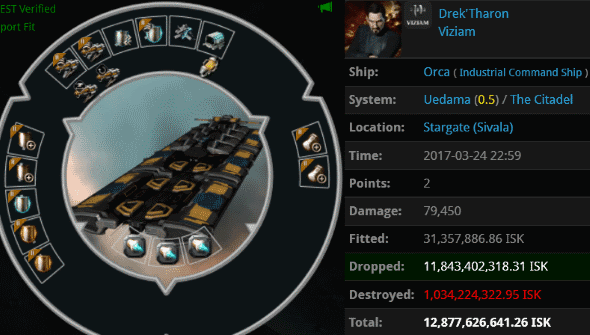 Drek'Tharon had a Fortizar that he desperately needed to get through Uedama. Should he use a freighter? No, too obvious. An Orca, then. Should he get a mining permit? No, too sensible. Drek'Tharon rolled the dice, hopped into Uedama, and ran head-first into Agents Jake Kusion, Justin Kusion, Jayson Kusion, Joel Kusion, Jeremiah Kusion, Johnathan Kusion, Joseph Kusion, Joshua Kusion, Jackson Kusion, Jayden Kusion, and Jason Kusion. KABLOOEY! The Red Frog Freight business has suffered mightily under the New Order regime, but only because so many of their freighter pilots insist on going around unlicensed. But normally they don't do it while in the official Red-Frog alliance. 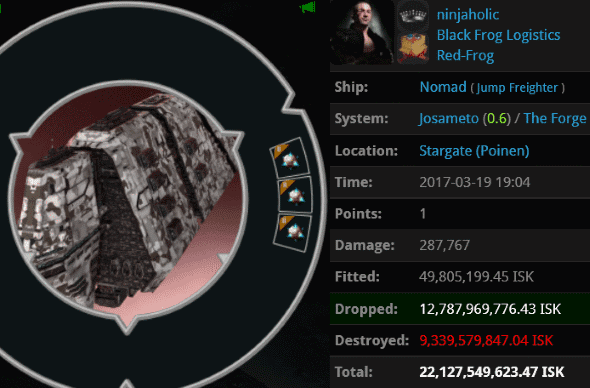 ninjaholic packed up a jump freighter worth 22 billion isk and autopiloted his way into the heart of The Forge. Agents Elite Highsec PvP, Jayson Kusion, SynthiaGreey, Jet Set Milly, Nigthhawk, dAbOsSlAdY77, Collateralized Contracts, Amanantian, Emergent Gameplay, Liz Cadelanne, Yojiro, Jason Kusion, ZAKURELL0 LINDA, Perlo Tissant, BAE B PEW, Urban Worrier, Jackson Kusion, Unfit ForDoody, Jayden Kusion, Hermann Fizzleblade, Jack Fizzleblade, Joseph Kusion, Justin Kusion, Bint Bint, Gottfried Fizzleblade, Micky Maken, Mark Ormerant, Jake Kusion, Karl Friedrich Fizzleblade, Joshua Kusion, Johnathan Kusion, Horace Goes Ganking, Jeremiah Kusion, Joel Kusion, Hagen Fizzleblade, BAE B BLUE, Franz Fizzleblade, Archibald Fizzleblade, Gate Security, Mina Mikakka, BEEPBEEP Yanumano, Weirdo McPedro, and Silicon Lips provided another demonstration of why Red Frog's rates have increased over the past few years. 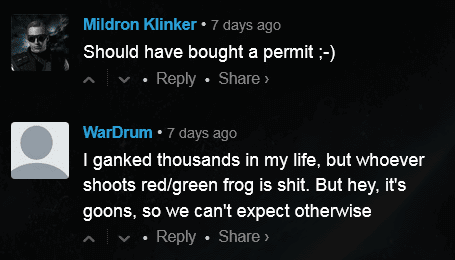 I have nothing against Red Frog Freight; I've used them many times to move ganking equipment. Their business is able to exist in this game for the same reason as the Code--EVE encourages emergent gameplay. However, I do think they should make it an official policy for their freighter pilots to buy mining permits. 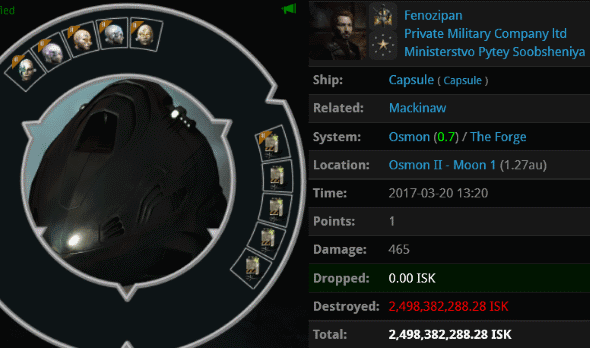 Fenozipan had a pod worth 2.5 billion isk. It was released only after his Mackinaw was ganked by Agent Liek DarZ. Why did a Mackinaw pilot need such an expensive pod, anyway? If you guessed "Michi", you're wrong. This is the pod of someone who once entertained the idea of combat, even if only combat against NPCs. Then he took up highsec mining as a career. What an unnecessary tragedy. wooooah antigankers are failing incredibly hard right now XD XD!!!! "In zsintai's case, the skill extraction may have been a bit too successful." Is this praying to James 315, grinding miner kills like sacrifices? Can we start doing goats next. By the blood of the ram I offer sacrifice to James 315 all hail. does a burnt offering count as a barbecue? I prefer tacos. "or be called (in future):WEAK"
People have called CODE weak, among other lies, for years. Yet CODE still kills anything, anytime, anywhere they want. You seem to be trying hard. Ask yourself if you relly want CODE members destroying you in every game you play. We don't do fair fights, just easy targets. Remember we police those who cannot put up a fight. EXPAND TO LOW AND NULL, SUPPORT YOUR CLAIM OF ANYTIME ANYWHERE. James - you missed one. Where is the KM for the Heart and Soul of the CODE. alliance? Ganked by cancer. GF. Long live James 315 and the New Order. It's lulzy how mad you are. I know right! Loyal salt best salt! Where oh where is Tweeps? All the famous names are gone, loyal got sad and kicked tons of people from his Corp like an angry carebear. 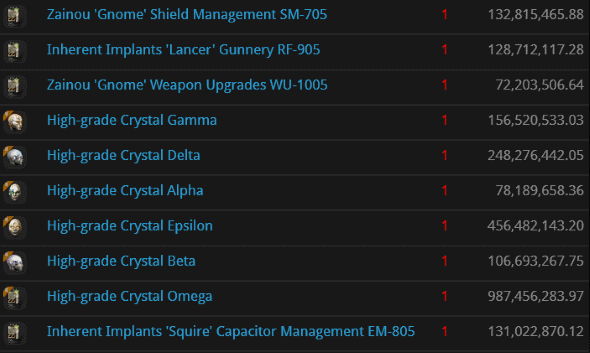 Codes acting like a highsec mining Corp now! "Codes acting like a highsec mining Corp now"
Does it hurt to be that ignorant, or is it really bliss? CODE sure do get a lot from kills its like bot mining miners. Yeah I see a lot of code alts mining. Why do GSF kills appear in minerbumping articles? OMG. 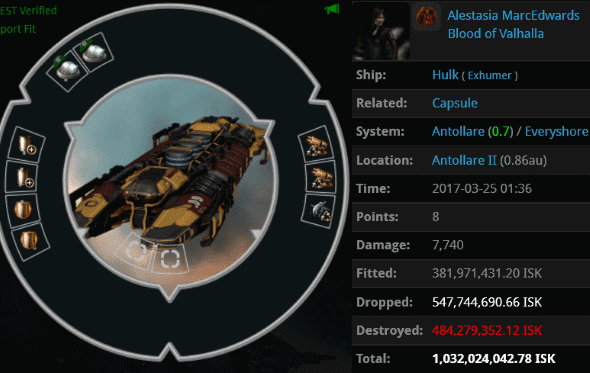 A 1.5 Bil ISK Venture!!! Bwhahahahahahaha! Evil laugh fail, terminate yourself.